The Twelve South SurfacePad for iPhone is a special accessory made for a specific group of people. The cover makes itself known by appealing to those who do not like cases and refuse to use one. That can be a large number of people, but it still only speaks to a small portion within that group. Some will find the SurfacePad massively appealing, lovely, and dignified while others may find its form too different or too restricting. When opening the SurfacePad, I first noticed that it had an adhesive to attach to the back of the iPhone. This threw me for a curveball since I’ve only ever come face-to-face with adhesives when it was for a one shot application. I was worried that once I installed the cover, that was it. However, after many “tests,” I came to realize that the adhesive is one that stays strongly attached, but it also lets me remove it and restick it numerous times without the possibility of residue or wearing. No corners were cut here, and none should be cut when it comes to protecting a device that costs hundreds of dollars. Beyond the unique adhesive application process comes the use of the cover. It is very sleek and made of luxury Napa leather, so the SurfacePad isn’t similar to those three-dollar cases you see on eBay or the imitation leather cases you see in stores — this is made of the leather seen in high-class luxury cars. The cover looks and feels incredible. With the type of attention to detail put into this, you won’t see any noticeable shortcomings. The way the SurfacePad is made and presented gives your iPhone a sense of elegance and extravagance that speaks on its own. Not many companies manage to perfect their own style and capitalize upon it, but Twelve South has clearly done it with their SurfacePad. The appeal of this cover lies behind people’s personal preferences. The cover itself is marketed to those who don’t use cases, yet the SurfacePad is really for those people who don’t use any iPhone-specific accessories while at home. The main issue I had with the cover is that I either had to sacrifice seeing notifications on my phone while it was docked or contort the cover in some way so it would properly fit on the dock. The dock and cover aren’t two accessories sold together, nor should they take each other into consideration, but if you use a dock regularly, you’ll have to decide if not being able to view notifications at a glance is something you can live with. Along with having to sacrifice the use of a dock, I also lost some of the ease that I’ve become accustomed to. For instance, pulling the phone out of my pocket while walking down the street requires the use of both hands to see who’s calling. 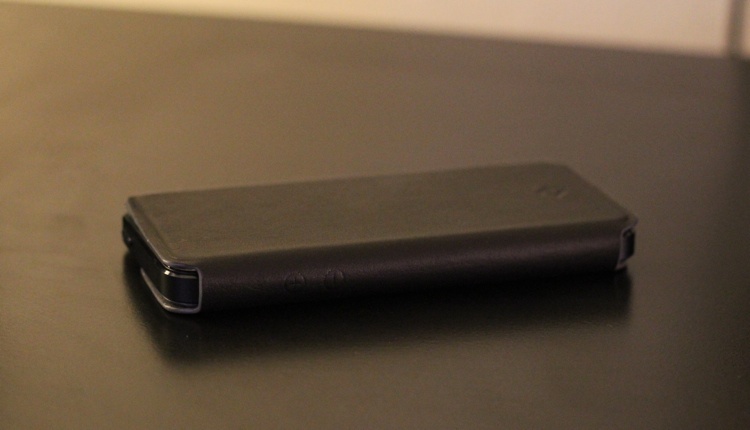 The top flap doesn’t shut with magnets or anything of the sort, so you could potentially swing the front open with the tip of your thumb, but it lacks the seamless ease of use I’ve come to expect when using my iPhone. The SurfacePro feels unique and professional thanks to the exquisite, luxurious piece of leather protecting my phone. With the smooth Napa leather and the use of some superior-level adhesive, it doesn’t feel like an accessory that someone had to make, but one someone wanted to make and took the time to ensure it was the best it could possibly be. It’s the level of design and elegance put into this cover that makes it one of a kind. You can find similar book-esque cases, but you won’t find anything that reaches this level of refinement. It’s a new type of cover for a modern level of class. The problems are entirely based on the type of person you are and how you use your phone. 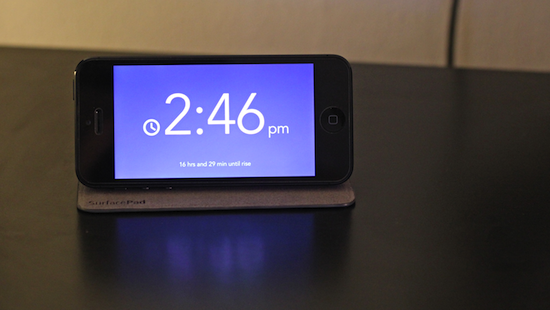 When I use my phone, I like to have it rested on a dock while at home. However, if you’re the type of person who likes to have your phone rested on a desk or propped up in landscape mode, this cover is made for you. Some prefer the ability to pull the phone out of their pocket and attend to it as soon as possible. Yet, some rather use their phone only when they’re not preoccupied or bustling through the streets. Those people need this. The SurfacePad is made for a specific type of person — the type that uses his or her phone leisurely, yet with sophistication. There’s a line that the folks at Twelve South have seen, and they’re attending to one side of it exceptionally well. The Twelve South SurfacePad for iPhone can be purchased for either the iPhone 4S or 5 for $34.99 on Twelve South’s site. If you want to either test the waters and use your phone differently or you already use your phone as mentioned, get this cover. It’s made for you. However, if you use your phone a specific way and aren’t ready to sacrifice or change habits, you may want to reweigh the pros and cons. This entry was posted in Accessories, Culture, Review, Tech. Bookmark the permalink. It seems like an interesting idea but the protection looks shoddy at best.